Make the cake: Place rack in center of oven, and preheat oven to 350° F . Using a pastry brush, coat both sides of a beehive mold with butter, making sure to cover all areas. Dust mold with flour, tap out excess, and freeze until ready to use. Sift together flour, baking powder, baking soda, salt, cinnamon, and a pinch of cloves. Cream butter and brown sugar with a mixer until pale and fluffy. Reduce the speed; drizzle in honey. Beat on high until very pale and fluffy. Add vanilla. Add flour mixture, alternating with milk, beginning and ending with flour. Transfer batter to a large bowl. Whisk egg whites until foamy. Add cream of tartar, and whisk until stiff, glossy peaks form. Fold 1/3 of the egg white mixture into the cake batter, then fold in the remaining whites. Divide batter between molds, and place them on a baking sheet. Bake for 40 minutes. Cover with foil, and bake 15 to 20 minutes more (a tester inserted in the middle of the cake should come out clean). Transfer molds to a wire rack, and let the cakes cool in pans for 15 to 20 minutes. Turn out cakes, supporting them with your hand, and place flat sides on rack. Let cool completely. Wrap in plastic wrap, and refrigerate for at least 1 hour (or up to 1 day). Carefully trim the flat sides of the cake halves with a serrated knife so each is level. Align the halves to make sure they are flush, then separate. Make the honey glaze: Bring honey, brown sugar, and butter to a boil in a small saucepan, stirring until sugar dissolves. Add vanilla, and remove from heat. Let cool for 1 minute. Brush a coat of honey glaze on the flat side of each cake half. Gently press halves together, and let them set upright for 5 minutes. (If they don't stay together, place a small bowl over top to hold the 2 sides together while glaze sets.) Carefully transfer beehive to a rack set over parchment. Spoon remaining warm honey glaze over cake until the cake is completely covered. Let stand until set. Make the sugar glaze: Bring water to a boil. Add 1 and 3/4 cups sugar, and stir to dissolve. Remove from heat; let cool for 3 minutes. Spoon some glaze over cake. (If too runny, add more sugar until glaze is the consistency of thick honey.) Pour 1/2 of the glaze over cake, letting it drizzle down the sides. Let set for 5 minutes, then spoon remaining glaze on top. 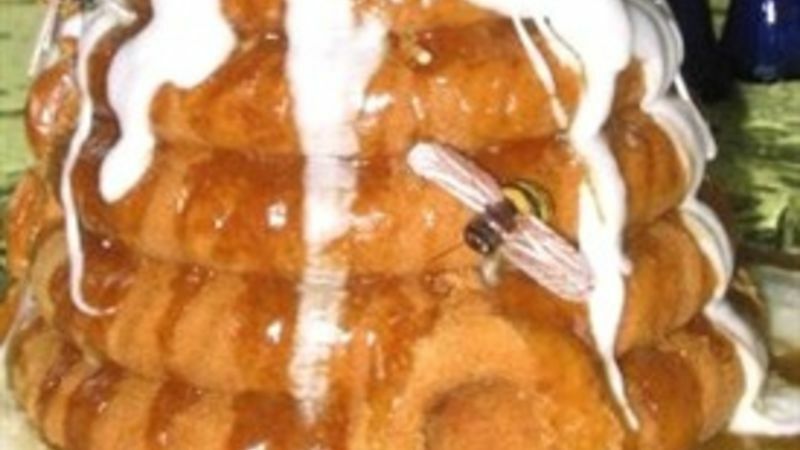 I didn't make the marzipan bees. Instead I went to the craft store and found some in the floral department. They looked better and sure weren't as time consuming as making them yourself. But in case you are so much like Martha, then here ya go. Directions for Marzipan Bees: Add yellow gel paste to 1 portion marzipan and black get paste to the other. Knead each to incorporate. Roll each portion into a 1/8-inch diameter rope. Cut each rope crosswise into 1/8-inch slices. Stack 5 slices together horizontally, flat sides facing, alternating colors, starting and ending with yellow. Press together gently. For the head, roll a yellow slice into a ball, and press onto body. For the eyes, roll 2 bits of black marzipan into balls; press onto head. For the stinger, shape the tail piece into a slight point. For the wings, press a sliced almond into each side of bee. Repeat.